New York Fashion Week is well under way, showcasing the hottest trends we can expect to find in stores and in street style for fall 2015. Along with clothing style, this is the time when the whole country looks to the runway for upcoming hair and makeup trends. One of the trends seen on the runway is actually a sleek and easy look for pretty much anyone to pull off: the perfectly polished pony tail. The models at Derek Lam were all sporting this minimalistic style with a straight center part, inspired by the classic American New York woman – think super contemporary sportswear with a New York Edge. 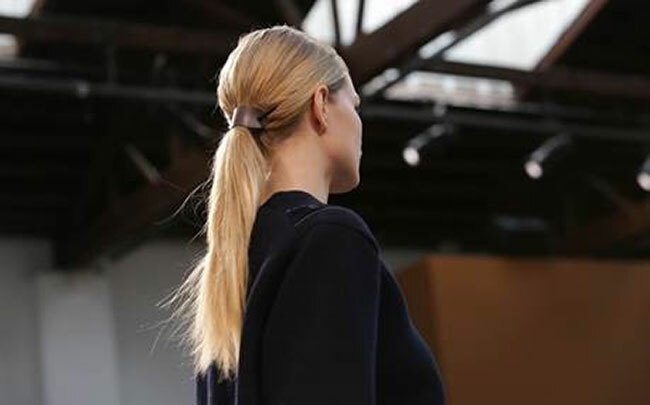 The look is a clean, graphic ponytail with a sharp center part. To get this look, here are some tips from pro stylist Orlando Pita for PHYTO. Blow dry hair with PHYTO Phytovolume Actif or PHYTO Intense Volume Mousse, depending upon the hair type. Pull back hair into a pony tail at the nape of the neck. Once the hair is pulled back, secure it with custom-made leather holders. Finish the look by spraying with PHYTO Phytolaque Soie Hairspray.